For years I used paper tape under my eyes to keep the area wrinkle-free. But in my late 50s I was challenged to find something that would work more effectively. 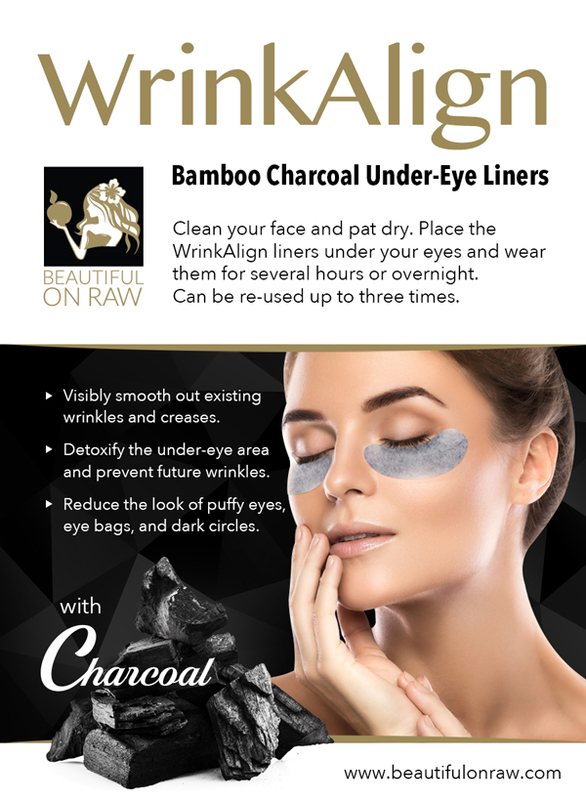 Here it is… my Bamboo Charcoal WrinkAlign Liners, in packets of two for your delicate under-eye area. How can Bamboo Charcoal Liners improve the look of your under-eye areas? The filtering and purifying powers of charcoal have been recognized for centuries. Ancient practitioners and modern science alike know its value. Think about the numerous places and ways we use activated charcoal already for health-related purposes. Water filters. Vacuum cleaners. Poisoning treatments. Treatments for stomach infections. Treating nausea. The list goes on. Consider: We can take it internally and expect it to help heal us. Can we expect it to be equally useful on the outside? It’s at least reasonable to think claims about skin benefits of activated charcoal are worth checking out. Do you know the difference between absorption and adsorption? Just one little letter—a b versus a d. Yet it is important for understanding how our under-eye liners work. Absorption happens when one substance enters completely into another. Analogy: You wipe up a spill with a paper towel, and the liquid’s molecules soak into the towel. Adsorption happens when one substance attaches to another. Analogy: When you dust, particles stick to your dusting cloth. Raw charcoal and activated charcoal. Here’s another distinction you need to know. We’ll skip the heavy-duty chemistry. Suffice it to say that the activation of charcoal gives it much greater surface area, hugely increasing the charcoal’s adsorption ability—its “stick-ability,” if you will. You’ll not find any purer or more natural charcoal than that produced from quality bamboo of even density and consistency. Bamboo charcoal’s stick-ability is extraordinary. The millions of tiny spaces in a piece of activated bamboo charcoal attract impurities to its surface. Because there are so many little spaces for those toxins to enter, one layer of our WrinkAlign can attract and retain a remarkable volume of harmful substances and, practically speaking, help make you look younger. Our Bamboo Charcoal Under-Eye Patches are made to fit your under-eye area… they will fit you perfectly. You can use your Under-Eye WrinkAlign Liners overnight, or use them for an hour or two when you first wake up. Either way, you might notice that your overnight creases will be miraculously smoothed… perhaps, gone entirely. You’ll be ready to face the day, fresh and new. And you’ll never think about Botox again! Ingredients: Water, Glycerin, Bamboo Charcoal, Sodium Polyacrylate,Croscarmellose (emulsifier),Polybutene (viscosity increasing agent), Hamamelis Virginiana (Witch Hazel Plant) Extract, Niacinamide (a derivative of Vitamin B3), Tartaric Acid, Glycyrrhetinic Acid, Polyglutamic Acid, Disodium EDTA, Diazolidinyl urea, Phenoxyethanol, Iodopropynyl Butylcarbamate. Some of these ingredients sound intimidating, don't they? Are they safe? Keep in mind what the ancient sage Paracelsus once said: “It’s the dose that makes the poison.” This remark became a basic principle of toxicology. Nothing is inherently completely good or bad. It all depends on the dose and intended use. The expression natural preservative is a contradiction. Extracts from fruits, vegetables and plants will go bad within a day, left on your bathroom sink. For any water-based cosmetics to have a reasonable shelf life, preservatives, emulsifies and stabilizers are a must. Without them, we can expect harmful bacteria to start growing right away. I used these WrinkAligns for months before offering them to you. I believe they’re totally safe. But should you have any reservations, please consider the alternative path of using simple paper tape. See the video on this page. Would you rather not use a man-made product? No problem! Make your own cosmetics. More information here.